A while ago, I had the privilege of working with a unique little girl in grade 1. She had a pleasant but quiet personality, was painfully shy, and had developed a pattern of selective mutism at school. This little girl had an older sibling with moderate-severe special needs and significant behavioural issues that often disrupted life for everyone at home. Upon further investigation, it was suspected that this little girl’s selective mutism, was likely related to her difficulty coping with stressful life circumstances at home. Although she was successful academically, it became apparent that she needed support to help her make sense of her emotions, as well as strategies to her thrive socially. Parents had tried traditional therapy, but nothing seemed effective. That’s when they reached out to me. When I first met this little girl, I could tell she possessed a certain maturity and emotional intelligence, which surpassed her chronological age. I had observed this before in children with selective mutism, which had presented to me as an admirable inner strength. Although she was immediately able to speak with me at our first meeting, it became obvious that she had adopted the role of the “pleaser”, and that it would require thinking outside the box to help her tackle her issues. While she answered questions politely, she did not share of herself beyond what was being directly asked of her, regardless of how interesting and fun the activity. This was a concern, as I suspected it reflected her tendency to cope by bottling-up her feelings. Intervention for her would require a comprehensive biopsychosocial approach to address core issues at the family systems level, support strategies for the teachers, and one on one sessions with the little girl in order to help find her own unique voice. As a first step, in order to break down those thick walls I suspected she had built around her sensitive heart, it was going to require some serious horsepower. So what did I do? I brought in the horses. When we first entered the pasture, the little girl’s eyes gleamed with pure excitement and awe at seeing the herd. She had been around horses before, but had never been invited to simply walk freely amongst a group of horses. This particular domestic herd, (which was by no means natural and wild), was a mix of geldings, mares, and pregnant mares. It did not surprise me one bit that the horses were immediately drawn to her beautiful energy. What happened next, however, was truly magical. The pregnant mares proceeded to surround the little girl in a sort of motherly circle of protection and comfort. The rest of the herd seemed to understand the intentions of these pregnant mares, and kept a respectful distance in acknowledgement that this little girl had become their charge. The leader of the pregnant mares, moved towards the little girl, positioning herself directly in front of her, and began breathing rhythmically over her head. The girl understood that she needed to remain still. Instinctively, both girl and horse closed their eyes and seemed to follow a synchronized breathing pattern, which took on a peaceful meditative quality. The other mares appeared to simply be holding space for both human and horse. They remained still like this for a good 20 minutes. You could practically feel the energy slowly chipping away at the walls surrounding the little girl’s heart. Parents told me that the little girl slept all the way home in the car. 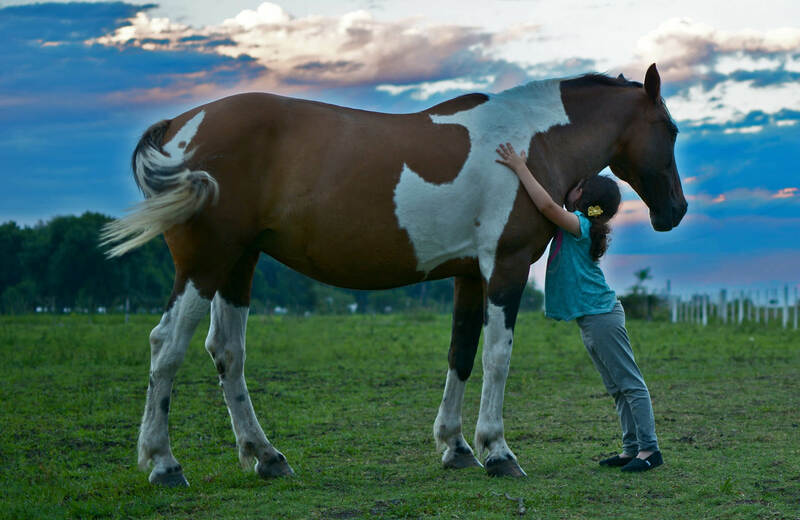 The emotional effects of this initial visit with the horses proved to be groundbreaking in her journey towards wellness. Following the experience with the pregnant mares, the little girl asked immediately with enthusiasm when we could do this again. She begged her parents to allow her to continue her visits with the horses. These visits had provided a powerful platform for engaging the little girl in her own unique therapeutic process. As our sessions progressed, we were able to benefit from the profoundly grounding and centering shared experiences with the horses, to tackle the core underlying issues surrounding her selective mutism. These experiences began to serve as a type of emotional warm-up (catalyst?) for the little girl, where she began to feel increasingly willing to engage in self-reflection and free expression. After each session, with the horses, we would follow-up with creative self-expressive mediums, (mostly arts), to visually reflect new-found awareness around relevant themes such as confidence, worthiness, safety, roles, and relationships. We made a point of being outdoors as much as possible for this part, in hopes to instill a sense of natural discovery, and an awareness of being part of something much larger than ourselves (and our problems). We used materials from nature to make beautiful things, and her parents commented on how the little girl looked forward to her sessions, which had not been the case with previous interventions they had tried. It was clear that soulful interventions “from the outside-in”, were having a positive effect on helping this little girl in more ways than one. It is well documented in scientific literature that we are all somewhat “nature-deficient”, just by the very way we are forced to adopt certain lifestyles due to jobs, and other circumstances. We now know however, that spending meaningful time in nature, can alleviate stress, anxiety, as well as improve our moods, and our overall sense of well-being. The key here, however, is to make sure that the experiences in nature spent interacting with the environment, reach you on a soul level in order for them to be truly effective. In fact, research suggests that when any health issue is addressed by incorporating the person’s sense of spirituality or soulful beliefs, they are more successful at making lasting changes that are still relevant over time. It was only after this carefully orchestrated process, which began with the help of the horses, done at the little girl’s own pace, that we were able to lay the foundation for introducing coping strategies, and for those strategies to be well-received by the little girl. It was important to introduce individualized strategies developed to work specifically for her, and only her. Rushing the process would have been counter-productive, as we can only help ourselves when we are emotionally and spiritually ready, despite the fact that we might already have the knowledge to do so, and are presented with the best proven programs out there. It was with great relief that the parents began to observe their daughter applying her coping strategies in her life with success. As suspected, the little girl had been in emotional shutdown from the unavoidable stress at home, which became magnified in highly sensory stimulating environments (like a noisy and busy classroom). The anticipatory anxiety of being stuck in these situations in turn compromised her ability to navigate social situations, by leading her to resort to using the protective mechanism of staying quiet. Although her parents were doing everything right, they lived with the guilt of not being able to fix everything. The fact was that their family life was intense. It was revealed that the little girl inherently knew this, and unconsciously tried to ease the chronically strenuous load off her parents by playing the role of the “easy” child, and becoming almost invisible. Progress did not happen overnight, and was not restricted to my intervention. True to the biopsychosocial approach, it required a team effort in all environments of the child’s life. Besides requiring “horse power”, it took 3 months to see results of our work together, and we could not have reached any of our goals without the strong support and participation from all family members and teachers. We all helped this beautiful soul to find the self-esteem to forge a healthy, distinct, and unique identity for all her valued life roles (daughter, sister, student, friend). By mid-year, she was no longer mute at school. It is important to accept the fact that some families live unavoidable, chronically stressful lives, despite the fact that they might be doing all the right things to assure everyone’s well-being. Having a family member with robust special needs is a prime example of such a situation. While working with this family, it was not possible to change difficult life circumstances (that naturally come with living with a sibling with special needs), but we managed to teach a child the importance of tending to their own wellness, in a way that was pleasant, meaningful, and easy to apply in their lives. In this case, I believe we have the horses to thank for that.